The new Speedo LZR Racer X will be the suit for the Rio 2016 Games. Wearing the right suit has long been one of the most important parts of swimming in the Olympic Games. To ensure competitive swimwear meets the expectations of Olympic competition and aren’t giving swimmers an unfair advantage, it’s necessary for every suit approved for the games to be on the market for at least one year prior to the competition. The latest Speedo championship racing suit is now available to ensure it is ready for the Rio Olympic Games in 2016. The Speedo LZR Racer X can be purchased now to give swimmers plenty of time to train with it. The Speedo FastSkin line has long been the top of the competitive racing market for many years. The Speedo LZR Racer X is the latest in this line. This Speedo championship racing suit was designed with the help of elite swimmers and state-of-the-art 3D body scanning techniques to ensure the perfect fit with less restriction. In addition, computer technology was used to measure drag and resistance. After more than 10,000 hours of work, feedback from 130 elite swimmers around the world and a team of researchers and scientists, the end result is a competitive swimsuit that offers swimmers all the advantages. Like all the other swimsuits in the Speedo competitive line, the Speedo LZR Racer X is available in a number of styles to ensure each swimmer can find the right option for their needs and preferences. The Open Back Kneeskin is the ideal option for women with maximum support and freedom of movement. It also offers ab activators for better body alignment and increased compression. The Closed Back Kneeskin provides similar benefits with a closed back design for greater coverage. For men, the suit is available in a Jammer and High Waist Jammer style. Regardless of the style, each suit is constructed of a polyamide/elastane combination and is FINA approved. All suits are available in a blue and black design. The Speedo LZR Racer X will prove to be the most desirable swimsuit for the 2016 Olympic Games in Rio. Now that this Speedo championship racing suit is available, it’s time to start looking ahead to the Olympic trials so you can be ready to compete. If you’re interested in ordering this competitive swimwear, contact us. 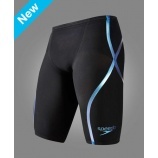 DJSports.com has the Speedo LZR Racer X available now in all three styles.